Gathering Frost is a reimagining of Sleeping Beauty with a twist on the story we're used to - instead of sleeping, the kingdom is in thrall to the Queen, including Jade, the main character. The Queen has frozen all emotions except for fear and dread to keep everyone under her control. Genius idea! Jade is in the Queen's guard and the only female because she's so kickass. I love a strong female character, and it isn't just her frozen heart that braces her in the face of danger. She possesses true bravery and courage, the likes of which some of the men around her are sorely lacking. She's intelligent - always thinking one step ahead. When she meets the Queen's son, Prince Asher, and is tasked with deceiving him, it's quickly apparent she's met her match in wit and strength. I was surprised by how different he is from his mother - he's warm and caring. I loved how he was more amused by Jade than threatened by her. I think it was because he could see something within her that no one else could, maybe something she couldn't even see for herself. My only issue with Gathering Frost is that a couple of parts felt a little slow to me. My mind kept wandering during those times though I had no distractions around me. Something pulled me out of the story for some reason. It's a fast read though as in I read it all in one sitting and did enjoy it. The relationship between Jade and Asher will probably seem like instalove, but this is a fairy tale reimagining and love happens fast in fairy tales. There are plenty of complex obstacles for them to navigate to make their story interesting. Jade is supposed to be deceiving Asher, but at what point does she stop, if ever? Or is she only deceiving herself? I'm excited to find out what happens next! 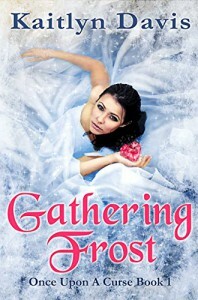 Gathering Frost is a book I'd recommend to anyone who loves fairy tales and strong heroines in YA fiction.